Previous Viewing Experience: I’ve seen this at least four times, but most of them were pretty soon after it came out on DVD, so it’s probably been four or five years. Wow, that makes me feel old. Previous Reactions: I pretty much fell in love with this movie when I first saw it (hence the seeing it again so often so soon). The colors, the music, the quirk, the charm. Mostly the colors, if I’m honest. 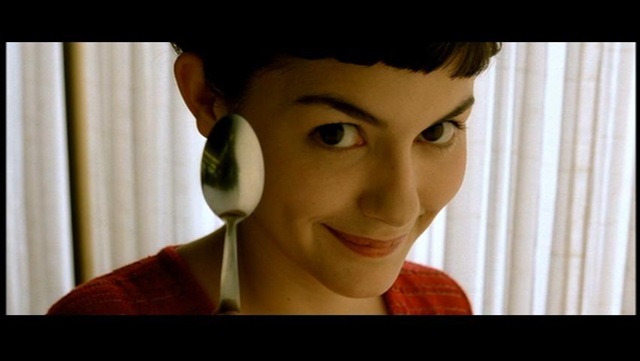 Brief Synopsis: Amelie Poulain lives and works in Montmartre, but doesn’t connect very deeply with other people. When she finds a long-lost box of toys and successfully finds the overjoyed owner, she decides to do random acts of kindness (and meanness, in one case) – one of which may lead to romance if she doesn’t chicken out first. Response: Interesting reaction this time. I’m still charmed by the film, and for all the same reasons as before. But I found myself also a little disappointed at its obviousness. Which I think is a function of having seen several Krzysztof Kieslowski films over the past year. Jeunet’s use of vibrant color seems directly borrowed from Kieslowski’s later films (the French ones), and since the cinematography is one of my favorite things about both Amelie and Kieslowski’s work, I couldn’t help comparing them in my head. And Kieslowski is better. Amelie’s problem is that she’s afraid of connecting meaningfully with other people. That’s why she spends more time pulling pranks and tricking everyone else in the story (whether for their good or ill) rather than concentrate on her own life. Ultimately, that’s why she constructs elaborate schemes and false identities that keep her in contact with yet also distanced from Bobo. And that’s great, it’s a fine storyline. But then Jeunet introduces a brittle painter who can’t quite capture one girl’s expression in the Renoir he’s copying. Why? Because she’s in a group of people and yet not connected to them. Over and over the fact that this girl and Amelie are the same is reiterated. 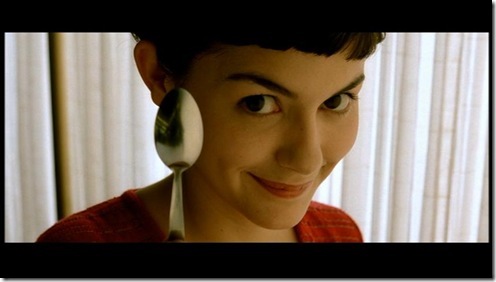 Over and over the painter explicitly pushes Amelie to take the risk, to open herself up to others. Again, not a bad thing in and of itself, but Kieslowski takes a similar storyline of people who have cut themselves off from the world emotionally in Red and carries it out with much greater subtlety and ambiguity. Perhaps that’s why Amelie is #92 on this list and Red is down at #39. I still love Amelie, don’t get me wrong. It’s delightful, and it remains one of the two or three best introductions to foreign films for the subtitle-phobic. But it’s a gateway drug to world cinema, and if you like it, move on to the harder stuff.